The feel good about feeling bad record of the year. 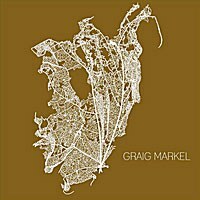 This is a quiet, moody collection of tunes from the mysterious Graig Markel. There’s a beautiful sadness that creeps into your bones via tracks such as “Purple Hearts” and “My Last Words”. Markel doesn’t beg for comparisons to his acoustic-driven peers, mostly because he doesn’t sound like any of them. That’s not just refreshing –– it’s rare, especially in our present derivative climate. Fact is, if you didn’t know better you might think this was a lost record by some forgotten folk artist from the heart of the early ‘70s –– but even then that artist would be peerless. This isn’t a happy record but it is darkly beautiful and darkly uplifting.